Centrally located home-studio in Carlisle WA (map). FREE interview and introductory lesson. Introductory tuition materials and texts provided FREE. Usually held at the same scheduled time each week. The best learning format for students of any age. Adult lessons - 60 mins. 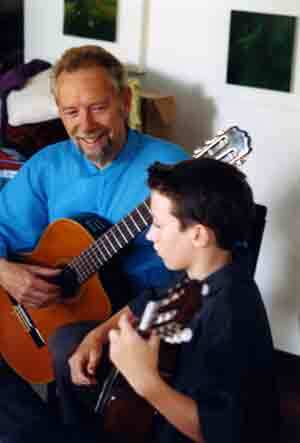 Learn guitar with others of your age group or playing level. For Introductory Courses, Adult Appreciation Classes, and some Children’s Courses. Group members attend one session together each week. Enquire about vacancies for this format –limited availability. A rewarding and fun activity where students play specific pieces of music or repertoire together in a large group - open to any student (not just CGL students) of any age who has sufficient playing and music-reading skills to participate - usually held once a month with a fee payable on the evening - a typical rehearsal class is 60 mins + (with refreshments after). PROFESSIONAL COURSES for teaching or performance qualifications. e.g. AMEB, AGME, ANZCA, or Trinity College London examinations. 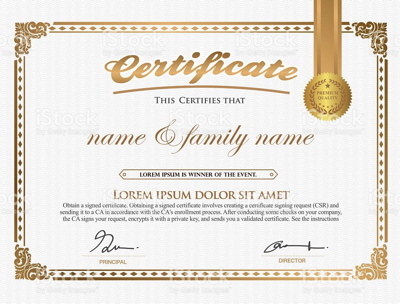 like to set specific learning goals and obtain official recognition for their instrumental achievements from a national examiner. Should tuition begin after the free introductory lesson and interview, fees are then payable in advance for a period of one month (4 weeks), OR one term (10 weeks) – which ever may be preferable. Introductory Courses are generally 6 weeks in duration, and also payable in advance. Over recent years The Classical Guitar Lounge has formed a close relationship with the Guitar Society Orchestra. It has willingly taken in our more experienced students as player members, as well as performing compositions by our Director, Peter Altmeier-Mort. This is a wonderful opportunity for students to further develop reading, musicianship, and performance skills, while enjoying the fun and support of being in a large group of competent guitar enthusiasts. 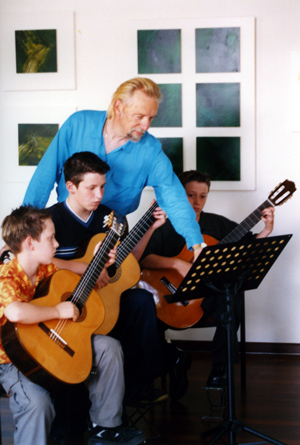 So if one day you'd like to be part of WA's premier Guitar Orchestra, just enroll in our lessons or Ensemble Classes and we will train you to get there!